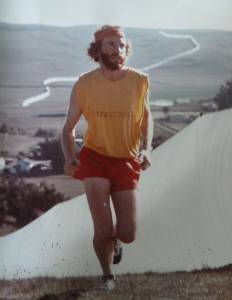 An odd set of circumstances led me to wind up on the cover of Runner's World for an article about Christo's "Running Fence" in the fall of 1976. That's how I came to know about, and to some extent know, Christo and his wife Jeanne-Claude -- and of course, their art. To do the article, I got roped by Christo into working on the last stage of the project. My sister joined me, and she appears in the Maysles brothers film about this project for a few moments -- a brief but possibly more lasting memorial than my forgotten magazine cover just the month before Runner's World finally went to slick paper and color. Running Fence (1977) is Albert and David Maysles' second Christo docuentary, following Christo's Valley Curtain (1973). Decades of filming the projects followed, almost 35 years. The long association is no surprise, because involvement in Christo projects can be addictive. Even in my few days on "Running Fence," I encountered several of their loyal camp followers, including one who said he knew when the idea for this one first occurred to Christo. Just after the Rifle Gap, Colorado "Valley Curtain" was completed, he told me, the artist got a faraway look in his eyes and said, "My next project will be a long one." I like this notion of the vaguest germ of an idea turning into years of intense, frustrating work, the involvement of hundreds of helpers, and finally a grand environmental project costing millions of dollars to carry out that vanishes in a couple of weeks. I had called a number and been summoned to Vally Ford, California, the field command HQ of "Running Fence." Later I learned Jeanne-Claude was the daughter of Jacques de Guillebon, a French army general on a level with De Gaulle, and it made sense: she was certainly the heart and organizing power behind projects whose challenging high-pressure logistics rival any military operation's. Watch Maysles' Umbrellas and you'll see what I mean. But through watching all the films, I've realized the division of labor is false, because both did everything, except that only Christo made the preparatory drawings and collages and models. It's sad Jeanne-Claude is gone; she passed away November 18, 2009, at 74. It is hard to imagine the couple, born on the same day, parted prematurely by death. The Maysles films and the work itself show the Bulgarian escapee from the Iron Curtain and his wife the French general's daughter, both born June 13, 1935, to have been one of contemporary art's great working partnerships, not to mention stars of a great romance. 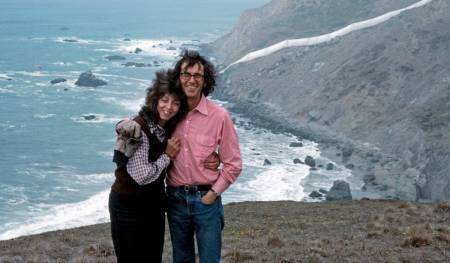 While he has a single-minded intensity, she provided warmth and social skills, working side by side with Christo on every project from beginning to end. Her essential role as collaborating artist is now acknowledged and the work is attributed to "Christo and Jeanne-Claude." Christo came out on the porch and talked to me briefly, insisting if I wanted to "run" the Running Fence and write about it, I had to work on the project so I'd have the T-shirt; otherwise my presence on the ranchers' land might be considered trespassing, and "nothing that jeopardizes the project" could be allowed. So I followed the instructions and I did it. It was not something I'd have volunteered for, but the experience was memorable. Above all it taught me what the Christo and Jeanne-Claude projects were all about. Clearly people came to the projects to scoff and went away awed. There are plenty of scoffers, and some permanent ones. These include the New Yorker's reigning art pontiff Peter Schjeldahl, who was smugly condescending about "The Gates," when it was finally completed in Central Park in 2005, and my college friend Howard, a former art writer for Newsweek, at whose Sonoma summer house my sister and I stayed when working on "Running Fence," who dismissed Christo's work as passé. It's been done, he said. Indeed the artist has done the same thing, differently, over and over again. But in different places, and in different forms, and for different people, within different systems. I knew nothing of it. To me it was new. It had not come to me till I saw the word "running" in a little article in The Atlantic about "Running Fence" before it had come about, and as one who had begun running long distances, was intrigued. Later, in the Msysles' Islands, Christo argues that painting was invented by a Dutchman to make art a more salable commodity, but that traditionally art was more public, shared, more a combination of things. We might see his projects as closer to cathedrals, if ones that quickly vanish, than to paintings or sculptures, though they are seen, mistakenly, as sculptures. They are complexly physical and material, and yet purposefully ephemeral, powerful but mercurial homages to germs of ideas. It seems a bit odd that an art critic as sophisticated as Schjeldahl is tied at this late date to the "problem" that "art used to mean paintings and statues," and now it lacks a "commonsense definition." 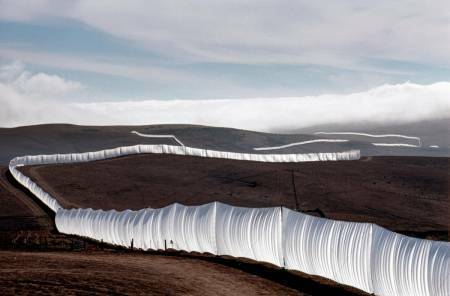 I suspect that Schjeldahl's objection to Christo as compared to so many other minimalist, temporary, or environmental artworks he has no trouble with is that Christo's are different in being so large, visible, widely publicized, and popular. The elitist in me wants to agree; the democrat in me finds this view deeply offensive. Christo and Jeanne-Claude point out that their funding every project independently through sale of his drawings and collages keeps them independent and "free." This is always the work of a man who escaped from behind the Iron Curtain, where the State controlled everything, including the landscape. The projects assert art's democratizing potential, and are the work of artists who cannot be bought. It's puzzling that Schjeldahl has problems with definition in confronting Christo after Duchamp, after forty years of conceptual art. Again I suggest this difficulty comes merely from the way Christo and Jeanne-Claude make conceptual art viscerally accessible to millions of people, arousing debates on the street and making art critics irrelevant. 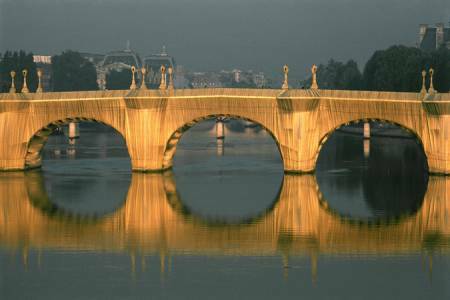 One sees that irrelevance in the Maysles film Christo in Paris when the bearded French art critic Pierre Restany, an early supporter, and godfather of their son Cyril, expatiates on "Wrapped Pont Neuf" and it adds nothing whatsoever to what we already know from the visceral experience the film has provided us. Not that I object to criticism or elucidating anything. But Christo's populist projects are self explanatory. Later an article by Michèle C. Cone* on the occasion of Jeanne-Claude's death relates that there was a falling out between Jeanne-Claude and Restany when "he said to them in a half-drunken jest to stop making these costly projects, it was a waste of money, the drawings spoke for themselves." If he really did say that, how like an art critic, and how much that misses the whole point, to overlook the importance of the "hardware" part of the projects, just as Schjeldahl overlooks all the work that goes into carrying them out. For Christo, art is meant to bring joy and beauty and a new vision of the world around. This fits well enough with the writer about the Italian renaissance Bernard Berenson's idea that art should be "life-enhancing." But for the post-Seventies post-conceptualist art critic, art is something to be explained, and they may secretly feel their side of it, the explanation itself, is enough. In his New Yorker piece, Schjeldahl pointed to "acolytes" surrounding "The Gates." Indeed those involved in Christo and Jeanne-Claude projects, even the wealthy collectors who provide funding for them by buying his drawings and collages, turn into "acolytes." Schjeldahl's summary of how the artists work, meant to be disparaging, is accurate up to a point. First, as he says, they "propose a grandiose, entirely pointless alteration of a public place." (Does art usually have a "point"?) Then they encounter a lot of "public and bureaucratic resistance" that eventually is overcome. Then the project is briefly up, and the public comes. At this point Schjeldahl blithely passes over without mention the major aspect my sister and I experienced a little of: the enormous amount of collective teamwork that goes into mounting the projects and later removing them. And Schjeldahl's description of the experience of the Christo projects by onlookers is typically unfair -- he has not worked on a project; he is not a convert. He makes then sound like mere happy gawkers. Some are that. So are many who crowd today's art museums. Some have an intellectual and aesthetic experience. Some just have lunch. But the completed project and the public viewing of it are only the tip of the iceberg. The Christo & Jeanne-Claude web site calls it the "hardware," the rest, the "software." The software is the long period, and all the effort, leading up to the completion of the project. This is where the Maysles films come in handy in a way the handsome Abrams art books can't, because you need films to show the complex process, the long struggle for the permits, the logistically challenging construction, the fabric moving in the wind and water, all of which are the work. The Maysles' Christo's Valley Curtain and their other films that followed have this value. 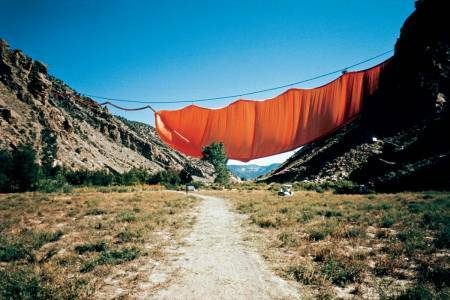 The Coloroado project was a bright orange fabric extended across a canyon on wires, and dropped down, like a curtain. Clearly, "Running Fence" was a longer -- much longer, over 24 miles -- extension of the same thing, but only 18 feet high, and over rolling semi-barren hills. This first film is only 28 minutes long. It's about the ticklish few days when the "curtain" went up. The engineers or roustabouts -- as usual with the Maysles, there's no voiceover or titles -- are up there, and there isn't any horde of temp laborers like me and my sister involved. A Maysles cameraman is up there with them, as well as on a golf course, and off in another direction, providing a view. We don't see crowds this time. What we see is a dangerous, ticklish, nerve-wracking project involving a crew of construction people, engineers, and consultants. And they are all very tired and excited. "Ya gotta wanta do it!" yells one worker, and "This is a vision, boy!" exclaims another when it's up. The Maysles capture how thrilled people involved in "Valley Curtain" are, and awed at Christo's imagination and boldness at thinking up such an idea, how viscerally they feel the connection between the germ of the idea and its physical embodiment. Wind made it tricky to unfurl the curtain, and 28 hours after it was up, "gale made it necessary to start the removal," the artist website says. As the Maysles' film vividly shows, "Running Fence" faced trouble with the setting up due to wind too. It is clearly a strung out fabric in nature idea that's basically similar to "Valley Curtain," but the effect is far more spectacular and sweeping, since it moves far out onto the land, weaving back from side to side over many winding hills and, by intention, crossing town, highway, farmland, suburb, and ocean's shore. I may be prejudiced, because I was there, but I find this the most beautiful of all Christo and Jeanne-Claude's fabric-in-nature projects -- not counting the wraps of structures, which go back to his earliest work in Paris before they were even together (they were a couple for fifty years), but are a different kind of thing. The Maysles' Running Fence is different from Christo's Valley Curtain -- appropriately -- in that much of the film takes place before the fabric is hung, before the project is even approved. (This is the direction the later films will take: local board hearings and meetings with government people play a big part also in the 1987 Islands and the 1990 Christo in Paris.) Most of the ranchers were easy to convince; it's the bureaucrats -- and jealous or resentful California artists -- who made trouble. A priceless moment is provided by the ranch wife who gets up to say that some of her meals are works of art, in her opinion, but they're gone right away, so this could be the same. Christo says, "The work is not just the project, the steel poles and the fence. The project is right here. Everybody is part of my work. If they want or don't want, anyway they are part of my work." His vision is democratic: "I think that 20th-century art is not a single individualistic experience," he continues. "It is a very deep political, economic, social experience I live right now with everybody here. And it's nothing involved with the make-believe." What Christo is saying at this zoning board meeting is not a hard concept to grasp in theory, but to feel it in the gut one needs to experience the whole shebang as a participatory observer -- maps, drawings, government meetings, volunteers, engineers, sweat and tears, scoffers, debates, crowds, admirers, the struggle, the beauty, and the fading away. The Maysles provide a closeup view all that whole process in action in their Christo films, of which there are six, all but the last collected in Plexifilm's 5 Films About Christo & Jeanne-Claude box set l(2004), with commentary tracks by the artists with Albert Maysles. The films, spanning thirty years, are a monument, made small only by the daunting achievement of the artists. Nathan Rubin of AV Club puts it well when he says, "The Maysles' accomplishment here is formidable, but their subjects' Herculean endeavors dwarf it. Only crazy dreamers like Christo and Jeanne-Claude could make five gorgeous and evocative films, made on multiple continents over a period of decades, seem like a modest accomplishment by comparison." In the set, which I've reviewed individually on Filmleaf, Christo in Paris, completed in 1990, is particularly charming and touching, because it shows the couple returning to the city where they first met. The other side, the non-art side, of Maysles Christo films tells, as Charles Taylor pointed out in Salon, is the "story of a romance," a "portrait of their marriage, which, from all appearances, looks to be a volatile, sometimes squabbling and altogether rock-solid union." In this film they take great pleasure in telling about how they met when her mother had him come to do her portrait and he became like a son -- but then her parents cut her off for two years after she abandoned her correct officer husband after three weeks and went to live in the refugee artist's garret. "I had money and he didn't," Jeanne-Claude says. "I have never used my money for anything. While Christo, without money, could give me a very exciting life." The family rift was healed, as we see in Christo in Paris, when Christo and Jeanne-Claude's mother are smiling together and her father, De Guillebon, does all he can to introduce them to influential French figures like Michel Debré, and others. And Chisto and Jeanne-Claude finish each other's sentences, often arguing, but often walking hand-in-hand, like young lovers, in their fifties and beyond. The shared dedication to the intense, consuming projects is the lasting bond that, in turn, would not be possible without the long-lived romance. The Maysles films provide as direct a record of this warm and volatile everyday love affair as they do of this couple's 50 fabulously prolific years of creating art. Say it is not art? Fine! You are part of the project! Umbrellas, about the project carried out simultaneously in both California and Japan and where there were accidents and two deaths, and the artists made 67 trips back and forth to Japan, shows the artists' capacity for overcommitment: hubris, if you like. Their whole lives are, if you look closely, hubristic in this way, unimaginably ambitious and productive on a grand scale for over forty years. As an artist I feel dramatically humbled by their work, but I also feel a friendship toward them and kinship with them I can't feel toward, say, Picasso, or Vermeer, because Christo and Jeanne-Claude's work is so participatory, so populist, so accessible. It's fun, grandly irrational, frivolous in a positive way. The Gates, in NYC, their home town for over forty years, ironically took more than half that time to get approved, and is a fitting end for the six Maysles Christo films. It's a spectacular film, fulsome in its representation of the clever meanness of the critics and opponents who call the saffron-orange fabric mounted flapping on big frames on 23 miles of Central Park walkways "a desecration of a work of art" (the park) or of "nature" (though Jeanne-Claude ripostes that Central Park is "totally man-made"), The film is equally fulsome in showing the drama of the sudden unveiling when the rolled up cloth is simultaneously opened throughout the park -- the same trick as with "Valley Curtain," "Running Fence," and "Umbrellas" -- and (mostly) the negativity stops and the rejoicing begins. "You must come here," a lady phones her friend to say, "It's like a theater lobby; the park is full of people milling about and chatting in different languages." In mid-winter the monochrome park came alive with bright color, full of people. The artists came back visiting "The Gates" throughout the two weeks, Christo, 70 now, like an aging child, exclaiming "Beautiful!" and "Look, chérie, look! Look!" The man is his own best audience! The film shows many lamenting that the project was to be up for only two weeks. It should have been a month at least, they said, or all winter. But at this point, I realize the truth of what Christo is repeatedly seen saying in the Maysles films: what makes the projects special is that they only happen once, and briefly, and people come to see them because they can never see them again. The brevity is a gesture, a statement of modesty and impermanence. He has claimed it takes more bravery to make art that is temporary. Well, all this is debatable -- and the debate, as always, is part of the work. For me, the Maysles films and the Christo works they so neatly describe are an art class that's stimulating and profoundly moving in more ways than I can describe here. And it all started with the somewhat silly impulse to write an article about "Running Fence" for Runner's World. Plexifilm's 5 Films About Christo & Jeanne-Claude box set (2004), with artists' commentary track from that date as bonus material. All the films in this thread were screened with others by the Mayles brothers in connection with the Albert Maysles Memorial Film Festival organized by David L. Brown at the Vogue Theater in San Francisco, May 8 - 14, 2015. Albert Maysles died Mar 6, 2015 at the age of 88. *Michèle Cone reports doing an article, "A Sublime Folly, Christo’s Running Fence," in the Atlantic Monthly, Sept. 1976, pp. 90-96. That was the article that first tipped me off to "Running Fence's" existence.